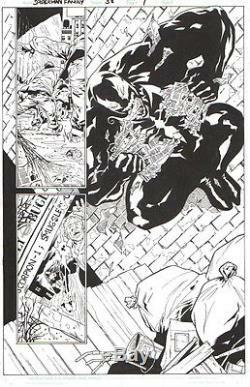 A beautiful splash page of 2007 Venom original art by comic book artists Leonard Kirk & Terry Pallot! This is the original splash page art to Spider-Man Family # 3, page 1 and features Venom (Mac Gargan)! On this page: Even though Mac Gargan is now fused with the alien symbiote known as Venom, he is still plenty upset when he reads The Daily Bugle and finds someone else using his old identity of Scorpion! The art on this splash page was penciled by Leonard Kirk and inked by Terry Pallot. PLEASE NOTE: This is an original, hand drawn piece of published Venom original art, not a copy or facsimile! This 11 X 17 inch page of art on bristol board is in excellent condition and would make a great addition to any Spider-Man Family, Venom,, Leonard Kirk or Terry Pallot collection! It could also make a GREAT GIFT! These charges are the buyers responsibility. And, check out my other auctions for great original comic book art! The item "VENOM SPLASH-ORIGINAL SPIDER-MAN FAMILY ART, LEONARD KIRK 2007-FREE SHIPPING" is in sale since Tuesday, November 29, 2016. This item is in the category "Collectibles\Comics\Original Comic Art\Splash Pages". The seller is "stevo861" and is located in Fort Lauderdale, Florida. This item can be shipped worldwide.